Our full collection of POLYWOOD® outdoor bar chairs and stools enables you to share your outside space and dress up your deck or balcony in style. Engineered to be both eye-catching and comfortable, our extensive selection features contemporary takes on the classic counter chair or bar stool design. The variety of styles among our collections guarantees every homeowner can find the right counter chair or bar chair set to match their outdoor vision. Between the traditional Chippendale look, the clean lines of Metro, and the simplicity of La Casa Café we’ve designed a variety of high-quality outdoor bar chairs for every taste. Invite over your family and friends and celebrate while seated on durable chairs meant to bring people together. Our ergonomic outdoor counter chairs and bar chairs deliver reliable support on their own, but you can deepen the comfort by adding a Sunbrella® cushion to your bar chair seat. The weatherproof fabric is quick-drying and fights against bacterial contamination so you can leave it out in the elements. Our outdoor bar chairs slide in at just the right height to elevate the style of any outdoor dining or entertaining area. Whether you use your outdoor bar or counter chairs on your back porch or by the pool you know they’re built to last. All of our outdoor counter chairs and bar stools are constructed from genuine POLYWOOD lumber proven to stand the test of time. Years of exposure to gale force winds, torrential rain, beating sun, and salty sea air won’t cause the lumber to rot, crack, peel, split, or chip. No matter which style of outdoor bar chair you like best you can choose between a wide range of earth tones and vibrant colors. Afraid your favorite bar set will fade over time? Don’t be — our signature Color-Stay Technology infuses the lumber with UV-inhibitors and stabilizers to ensure that the color lasts. Our durable, recycled HDPE lumber is also low maintenance, providing a stress-free upkeep process. When grime or dust builds up on your outdoor bar chair or counter chair just mix together warm water and gentle soap, apply with a soft-bristle brush, rinse clean, and your bar set will look like new. Drink in the sunrise and the promise of a new day with a strong espresso drink and your favorite pastries. From your perch atop your favorite bar chair you can revel in the untold beauty of a fresh spring morning before tackling your to-do list. Stretch out on the balcony and share in the latest gossip with friends as you sip a new cocktail recipe you’ve been itching to try. 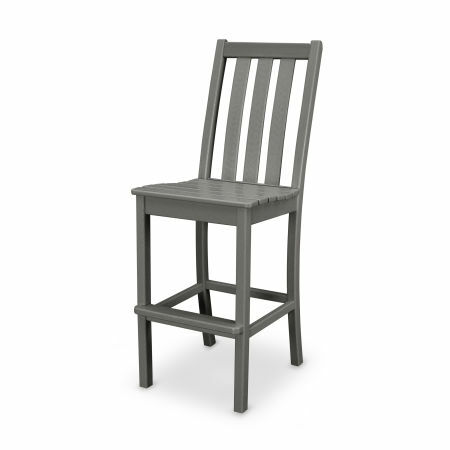 Swivel counter chairs ensure you’re always in earshot of the best zingers and one-liners. Maybe you’re not entirely sure what style or color will look best in your outdoor space, or you simply can’t determine the right amount of outdoor bar chairs to buy. Once you read through our pro tips on buying an outdoor bar or counter set you can confidently shop for an entire set knowing what points to consider and which materials work best.